Here is my adult entry for the "Hats" category at i ♥ faces. I have to say that I think my hubby looks quite handsome decked out in his turn-out gear. Whoo hoo! Visit i ♥ faces to enter your hat photo or to see more great entries! Lovvveee that photo! Great job! Good Luck this week! Great shot! He is so handsome! You have such a great eye for composition. Oh geez, another fantastic picture! You're on a roll girl. Love the dandalion shot too, that was sweet perfection. Congrats on your super duper win! New to your blog but love the fantastic tips and links. Thanks! oh I hope this wins! :-) I love it! firefighters are such heroes and you captured this so perfectly! Wow--your daughter looks just like him! I couldn't agree more! I hope you framed this and hung it in your living room! Or kitchen, or hallway...it's a BEAUTIFUL photograph! Definite winner there! Fantastic photo!!! I love everything about it - from the coloring to the composition to the handsome man! And your kids entry is wonderful as well - wonderful. I didn't get a chance to see your entry until this morning when it appeared on the top 10! 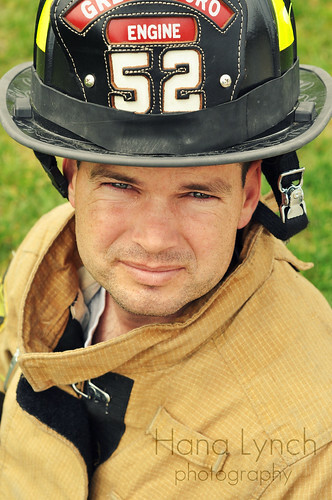 I love it, my hubby is also a firefighter, but I could never get him to pose like that. Amazing photo! Great job and congrats!